Ancient sages approached Indra the King of Gods and learns “ayurveda' the “Science of Life” and brings the' Ayurvedic knowledge to the moral world to make the humans, animals and plants free from diseases. 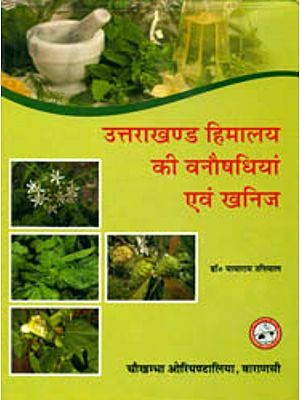 We come across “Pashu Ayurveda” Vriksha, Ayurveda' where the sages have dealt with the treatment to animals and plants which they were suffering from various diseases. To treat human beings the sages have shown medicinal value in plants, animals, minerals and guided us to utilise the same in various ailments. Plant kingdom being vast, we will have more number of medicinal plants compared to animal and mineral kingdom. To treat a suffering person, Ayurveda enlightens us to take very much care in prescribing the medicine. Because every plant used as medicine is carrying good and ill effect based on the constitution of individual. Hence Ayurveda has given caution in prescribing medicines and has enlightened us to use specific medicine for the disease, using medicines unknowingly, unspecific medicines, unwanted medicines induces ill effect on health. Many times this type of prescribing medicines brings death to the patient. Hence Ayurveda has given caution in utilising herbs, minerals and medicines from animal origin as medicine deviating from medical ethics that it has taught us. This book compiled and written by me is very much useful to the students, researchers and practitioners. 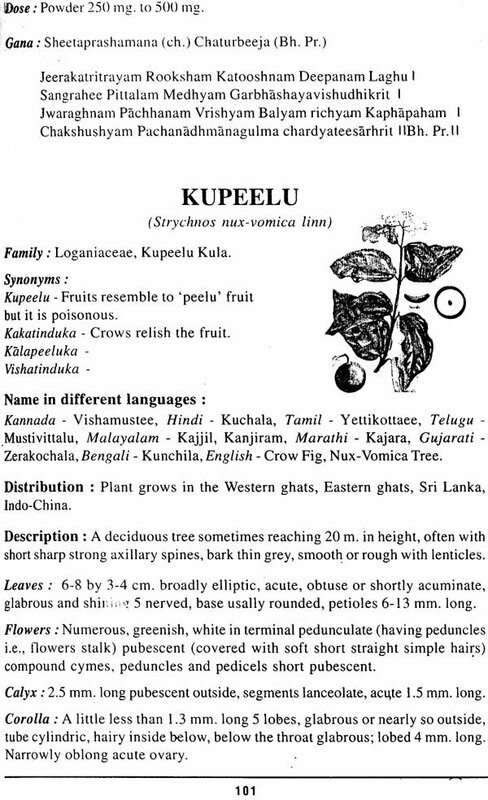 For easy approach the meaning of botanical words, the meaning for the same is given in brackets, opposite the concerned words. “Sanskrit Shlokas” concerned to the respective plants helps the students for easy remembrance of Rasa, Vipaka, Veerya etc.. Figures of individual plants in this book helps the student to know the morphology of the plants thus makes them easy to identify the plant. It is my duty to express my gratitude to those who either directly or indirectly helped me to bring this book before you. I am grateful to Sri S.G. Neginhal, I.F.S, Sri. U.S. Venkataraman, M.A., Miss. Mayuri, Mr. Lohit for having provided and allowed me to print the photos of concerned plants that they have had with them. My thanks are due to Mrs. Ansuya, without her cooperation it was not possible to publish this book. I thank Miss. Suman Y.N. who gave financial help, and to grateful to Dr. S.G. Neginhal and Shri M.G. Neginhal and other family members who are indirectly wished me sucess in publishing the book. I am very much thankful to Nagesh Babu .B. of Sowmya Prints who gave me courage and inspired me to print this book. Lastly I very much remember and thank Raghavendra K.A. of Sowmya Prints who has taken much pain to computerise the subject matter of this book.